According to BoatUS, if your boat trailer is going to spend the off-season outside exposed to the elements, here are five tips to protect your investment and eliminate problems down the road. A little spray will do you: Spraying lubricants such as WD-40 on metal trailer roller assemblies, winch gears and electrical connections will keep moisture away and rust at bay. It’s also best to take care of any rust spots now on the (galvanized) metal trailer frame: sand, prime and paint. Don’t park under trees: Some boaters think their boat will be protected by storing it under trees but the opposite is true – ice, snow, and howling winter storms can snap off tree limbs which come crashing down. Falling leaves and needles can also stain boat covers and gelcoat, or make their way inside where they can block transom drain holes. 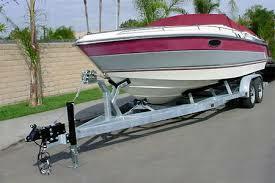 Turn it around in the driveway: If you’re going to leave the boat on the trailer in your driveway for the winter, face the hitch away from the street if possible, and put a lock on the trailer hitch. The name of the game in avoiding boat theft is to make your rig as difficult as possible to steal. Take care of the tires: In addition to being a theft deterrent, removing the tires and storing them in the garage or shed will keep the sun from damaging them. With the tires off, this may also a good time to repack the bearings (Another thing you won’t want to do in the spring). Block the frame and secure plastic (contractor grade) trash bags over the hubs and brakes to keep them dry. If tires won’t be removed, position the trailer so that the tires rest on a piece of plywood or plank to prevent dry rot, and cover them (again with plastic bags) to keep the sun off and hubs and brakes dry. To avoid flat spots from happening, move the trailer periodically a few inches throughout the winter. Help water drain: Keeping the boat and trailer rig in a slightly nose-high (bow up) position will allow water to drain out the transom drain hole. This can be easily done by placing a small block under the trailer jack. (Don’t forget to remove drain plug and tie it to the ignition key where you will find it in the spring). Also ensure that the boat’s cover is tight and periodically check inside throughout the winter – critters love to hide aboard boats and find them appetizing. For more information on the BoatUS Trailering Club and all of the services provided, visit http://www.boatus.com/trailerclub/ or call 800-395-2628. Nice post Captain Boat Safe! Some solid tips there, especially about removing the wheels from the boat trailer when it is parked up during winter. Few people realise the damage that gets done to tires while sitting idle and open to the elements.